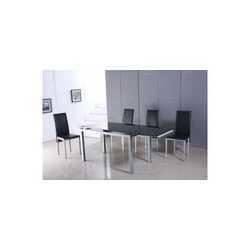 Clio - adjustable steel table with black tempered glass top, modern and contemporary. Suitable for homes and villas at the best value for money. Width (open) 200cm, (40cm/side), glass thickness 8mm, weight 40kg.